A positive life is what we need to have great time on this earth. Having positive habits is not a rocket science, it is how we bring change in ourselves daily. But normal humans like me are far from these positive habits. We like to snuggle into the blanket in the mornings. I need cup of tea, specially prepared by myself, before anything. I have to really force myself to drink water before that. And my excuse is that I drink water whole night. Yes, that’s true. Exercise is another boring thing which I have to do in the morning. I can think of 100 excuses not to do exercise. Waking up early is not a big deal but with a baby, it is impossible to wake up early because as soon as I wake up, she is ready to get up. 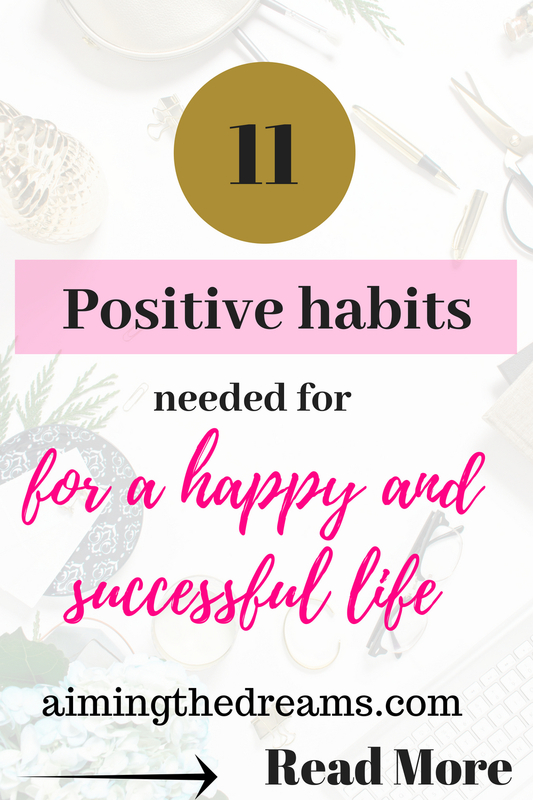 Hold on hold on, my life is a mish-mash of positive and negative habits. But I have managed few of these. 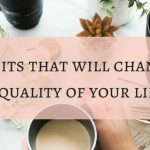 Which is really changing the quality of my emotional as well as physical wellbeing. Positive outlook is the most important thing in life to be happy. It helps in living life with purpose. As humans, our brains are wired to think about lot of things. We fret over little things and also about the situations which are either not in our control or they don’t come in our lives. We tend to make a cocoon around every single thought. Negative thoughts are more prone to become a cocoon. Now what I do is whenever something negative comes into my mind and start bothering me, I just shrug it off and think, why to waste this moment, I will face it when it will come. Rather think how beautiful present moment is. If we think about how beautiful life is, the life will reward us with more beautiful moments. Anger is an emotion which comes in the form of energy. You get angry on the situations where you feel frusterated. You can become angry with the person from whom you have some kind of expectation and that particular person doesn’t act according to you. There may be more instances where you can become angry but if you want to live a happy life, stop getting angry for littl things. Even if you feel angry, learn to forgive the other person as well as yourself. It is easier said than done. But whenever I meet somebody who is calm and doesn’t get angry over little things, I really ask them , how they do it. And one of my friend always say why to pay attention to all these things. Unless and until you have very big issues, don’t think too much about it. Just let it go. I also try these and believe me, it has made a drastic change in quality of life. Everybody in this world is so busy, that nobody has any time for others. So why you should think about what others will think about you. Do what you feel is right and will take you to some higher place, professionally, spiritually. Worrying about people will not take you anywhere. Rather it takes your energy away from the most important task of being happy. Happiness is the state of mind which can be felt with your inner self. And when you are thinking about others, you are taking time off from yourself. In this busy world, who has time to introspect the feeling which we feel inside us. Sit peacefully and listen to your self-talk. Think about what you feel about the tasks you have to accomplish them. If you feel stressful about something, pay attention to what is making you stressed. And if you are having a moment of happiness. what is the cause for that feeling. Being happy on something from your core means that what you are doing, is aligned to your own pholosophy. And if you are feeling bad about something, it means this is not what you actually want to do. Paying gratitude for what you have sets the tone for whole day. When you feel happy about what you have, your brain feel satisfied and your thoughts will be more aligned towards what you want. In our daily lives, we forget what we have and normally we fret over what we don’t have. When we sit and think about what we have, we feel happy. It changes the way we look at our life. Me and my husband moved to Australia five years ago. I felt good in starting , then as the time passed I started feeling sad. I missed my family, my friends. But not any more. Now I always pay gratitude in the morning for what this great place has given us. It has totally changed me. You feel positive whole day when yu start your day with positive affirmations. These are tonic for your otherwise negative thinking mind. Even if you have a habit of finding positive in everything, morning positive affirmations makes you more productive as well as more happy. Waking up early has many benefits and one of them is you get enough time to do your taks. You don’t have to rush to do things. Waking up early energises you for your whole day. Try to reduce the time by 10 minutes and you have made a good change. Breakfast is the most important meal which you should never miss. But most of the people don’r have time to eat breakfast in the morning. After dinner , your body has many hours to give rest to your digestive system. Also, it is hungry after dinner. Your metabolism will be better if you have breakfast and you will go for some healthy opions. Have you ever felt like eating anything when you are hungry? To avoid this, go for a big heathy breakfast. Our brain is always occupied with the thoughts which are sometimes not required. And as you start paying attention to every little thing happening in your life, you start feeling stress for every single thing. Even if you will have nothing to think, your mind will search for something to think about. Whenever you feel like you are feeling stressed with these little disturbing thoughts, change your thought process towards something inspiring. Gradually your mind will learn to change your thoughts whenever you will have disturbing thoughts. Most of us feel that fear of unknown. But this fear takes the pleasure out from this present moment. Rekindle the confidence inside you which means assuring yourself that everything will be alright and you don’t need to fear those things which are not happening yet. You will be more happy, more productive when you stop feeling the fear of unkown. Some time ago , I talked to one of my friend about something and what she said that, leave it, will see it afterwards, let that happen the way it wants, we have other things to think upon. After that I heard the same words from her so many times that I myself have started feeling the same way. And it has really helped me in putting a stop on fearing the unknown. Yes let the positivity flow in your life. Stop being negative. Whenever you will feel negative about anything , replace that feeling with something positive. Positivity is the feeling which we have to bring into life. Feeling positive about everything in life makes life more beautiful. Little changes daily in lives makes life better. 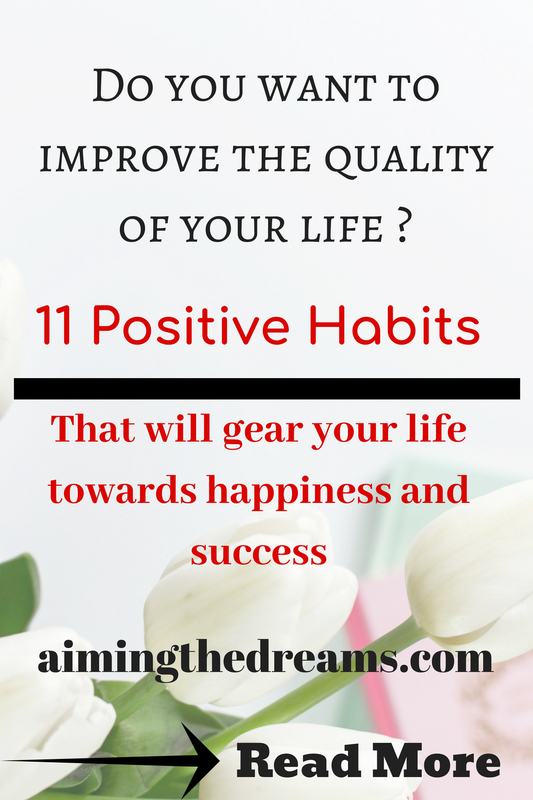 These are my thoughts on some of the positive good habits. I am working on all these to improve my quality of life. If you feel like you have some habits which are effecting your life, work on them or talk to some professional. Gursimrat, I found you on Bloggers Traffic Community, where I also am a member. You have some very worthy thoughts, here. Yes, anger and resentment will eat you up. I know that, yet, something that happened to me keeps nagging me, but I keep giving it to God to work out. I’m getting better. I try to stay away from people who are negative. Negativity is catching, like a bad virus! I don’t want it! You’re so right that people don’t take the time for others. Sad. People are so “I, me, mine” minded that no one else exists in the world but themselves. People who care for others, speak to them, have compassion, pray for them—who take their minds off themselves and on to others’ needs are happier for it. I also agree that being grateful for what you have and who you have in your life brings more good things into your life to be grateful for. Worrying, stressing, fearing: all these are negative energy stealers! In my case, as a follower of Jesus Christ, I’m constantly giving these things over to Him, the One who can do something about it…because in myself, I can do nothing to improve certain situations. 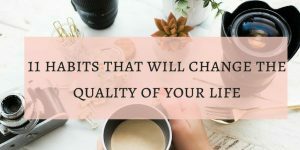 Thanks for bringing these things up so that those who read this will be reminded that they can indeed change their lives and their happiness by purposely being more positive! Thank You Cindy for a detailed comment. Yes being compassionate to others and for being grateful for what we have, makes life more meaningful and happy. Otherwise, time just fly.Thanks for your kind words. Great post! I really need to work on stressing about every little thing. Especially when planning travel I always am worrying about all the little details that I can’t control! Thanks Hailey. And yes these small worries takes the pleasure out of everything. It is like at one point, we have to tell our minds, stop worrying, everything will be fine.